Caitlin McEldowney scores the final run for Versailles Lady Tigers in 11-1 run rule win over Ansonia. VERSAILLES – The Versailles Lady Tigers defeated the visiting Ansonia Lady Tigers 11-1 to earn a run rule non-conference Monday night win. Ansonia came into the night with a 6-3 winning record. Versailles got the scoring underway in the bottom of the first with a Caitlyn Luthman 2-run single on their way to a 4-run first. The Versailles girls added a run in the second while keeping the visitors off the board to lead 5-0 after two innings of play. Luthman, Elli Morris, Abby Stammen and Caitlin McEldowney each picked up a RBI in the bottom of the Versailles fourth inning to stretch the team’s lead to 9-0 sending game to the fifth inning. Ansonia’s Trinity Henderson drilled a run scoring double to center for Ansonia’s lone run of the night making a 9-1 game with Versailles coming to the plate in the bottom of the fifth. Stammen opened Versailles fifth with a single to left, McEldowney singled to center and Hannah Barga doubled to center scoring Stammen for a 10-1 score. Burns was in the pitcher of record for Ansonia pitching two innings to open the game. Henderson threw two innings in relief. Versailles racked up 14 hits in the game with McEldowney and Barga each collecting three hits to lead Versailles. Faith Huddle, Luthman and Stammen each accounted for two hits on the day. Both teams played error free ball in the field. 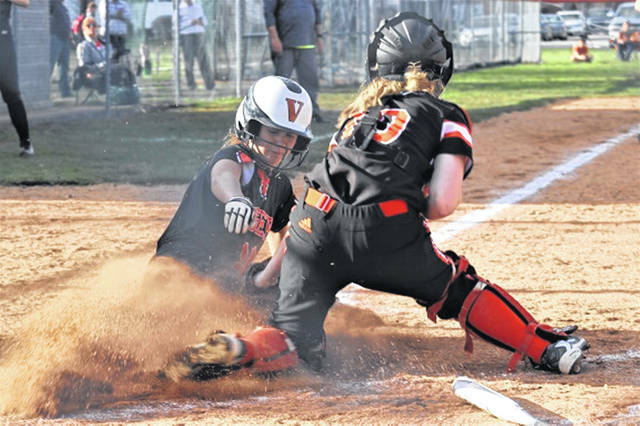 https://www.dailyadvocate.com/wp-content/uploads/sites/34/2019/04/web1_8-inch-McEldowney-Slide.jpgCaitlin McEldowney scores the final run for Versailles Lady Tigers in 11-1 run rule win over Ansonia.